A comparison of population dynamics of rotifers under natural conditions with those under intentionally-changed ones was carried out at one Lake and five outdoor pools. In Lake Numasawa, dominant rotifers under natural conditions for the past two years were Polyarthra trigla vulgaris, Kellicottia longispina, Ploesoma truncatum, Asplanchna priodonta and Filinia longiseta. Keratella hiemalis, K. cochlearis, K. valga tropica, Brachionus caudatus and Ascomorpha saltans appeared sporadically. Three months after the start of circulation of part of the lake water by a water power plant no remarkable changes were observed as far as the seasonal and vertical distribution of dominant rotifers are concerned. In five pools with different kinds and ratios of covering by such macrophytes as Eichornia and Lemna or reed screen, three types of rotifer communities were found. Type I: Liliferotrocha sp., Brachionus calyciflorus, (B. budapestinensis), B. angularis, K. valga tropica, etc., in which both densities and frequencies were generally reduced in proportion to the ratio of covering either with macrophytes or reed screens. Type II: Filinia longiseta, Polyarthra trigla vulgaris, Asplanchnella sieboldi, etc. in which densities and frequencies were increased by covering either with macrophytes or reed screens. 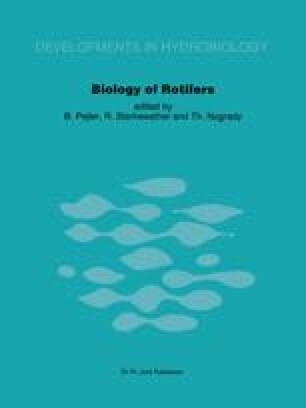 Type III: Trichocerca pusilla, B. quadridentatus, B. leydigi rotundus, Scaridium longicaudum, Euchlanis dilatata, Dicranophorus sp., etc, in which no precise correlation was found between occurrences of the Rotifers and ratio of covering.